A few years ago, the Wall Street Journal printed a front page story about a group of friends who started a game of tag in elementary school and kept it going as adults. "Tag" tells their story with Ed Helms, Jon Hamm, Jake Johnson, and Hannibal Buress as pals determined to tag Jeremy Renner, who has somehow managed to evade them. Determined to wreck his perfect record and catch him off guard, the guys return to their home town in time for Renner's wedding. The setup results in a series of stunts. Some are funny, while others feel forced. 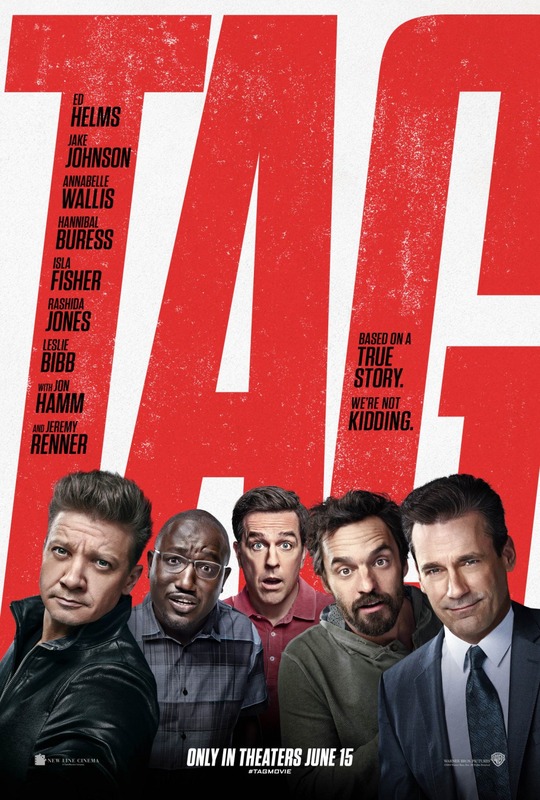 The best moments in "Tag" come during the credits, when cell phone video of the real men involved comes on screen, followed by a very silly music video featuring Renner and the cast. "Tag," rated "R," 2 stars. Does it deliver what it promises? Men behaving badly. Is it entertaining? Feels a little forced, but the end credits are genuinely funny. Is it worth the price of admission? Not great, but good for a laugh.